Trends change and fads come-and-go. But a visit to a candy shop, for the sheer sugariness or to rekindle nostalgia, is an enduring sentiment. Montana has a vibrant candy industry. From rows of obscure foreign brands of candy bars to handmade fudge from the kitchens of Mennonite grandmas, there’s a sweet for every tooth. 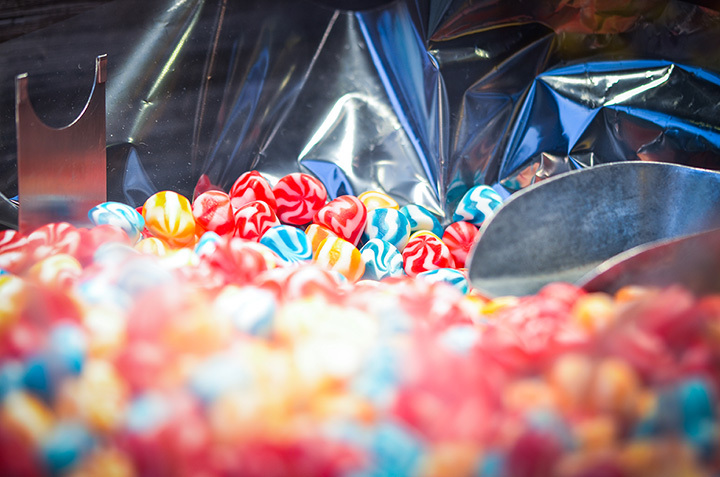 Here are the 10 best candy stores in Big Sky Country. An emporium is categorized by being large, being central and providing a plethora of goods. Self-proclaimed as the biggest candy store in the state, Montana Candy certainly lives up to its name. The store’s retro marquee sign dominated black-and-white photos of Red Lodge, and this tradition hasn’t been lost on the candy-makers. The candies here are made the old-fashioned way, in batches, from the hardest hard-tack to the most marshmallowy fudge. Also a claimer to the “largest in the state” throne, Candy Town may in fact take the cake (or candy?). Sure, they have fudge and caramels and chocolates, but most importantly, they’ve over one thousand varieties of candy. And that’s just the candy. Anything the child or the elder can envision is here: the nostalgic and the novelty, the sweet and the sour, the chewy and the hard-as-rock. If it’s not here, it’s likely not anywhere…in Montana, at least. Proudly adorning the recognizable “Made in Montana” certification, this candy company is local and handmade, through and through. The candies, be they truffles, brittles or caramels, materialize the old-school way: By hand, with elbow grease, handed-down recipes and local ingredients. Order a box of chocolates, or embrace the inner child and grab a foot-long rainbow lolly. It’s nostalgic and just plain delicious seeing “Candy & Soda Shoppe” on a sign. Hand-pumped sodas gurgle into sweet froths, all made from local ice creams and sodas, and multicolor indulgences twinkle in bins. The owners felt Bozeman lacked a quality classic candy shop, and the addition of a soda fountain set the retro ball in motion. Like the city in which it resides, the Moose’s offerings are eclectic: Jaw-breakers and suckers alongside locally-made chocolate truffles and fudge. Come for a classic, or a handcrafted seasonal specialty. Old. West. Candy. Exactly. This unassuming (but certainly not unadorned) candy shop is just alongside the narrow two-lane stretching across the Idaho-Montana border. About 40 minutes from Missoula, Darby is a rural hub for outdoorsmen and logging: It hosts the annual Logger Days Festival and is home to a handful of log-home construction firms. The dark, cabin-esque exterior opens into an antique store and a shimmering case of sweets: Rows upon rows of the chocolatey and the sugary and the flaky. They’re not wrapped in gold leaf, but make no mistake: These sweets are expertly hand crafted, an unmatched je ne sais quoi resulting from grandmas passing recipes to their grandchildren, generation after generation. Yep, it’s a barn: With a red-tin, steeply-sloped roof, providing shadow for a small outdoor patio. And past the patio, inside, this building is deceivingly gourmet. Just outside Missoula, this humble spot draws crowds for its handmade fudge, be it peppermint, pumpkin or pure chocolate and sea salt, and the “bark”: Shards of chocolate, laced with brittles or swirled with fruit purees or nuts. It’s also a great storefront for a host of locally made candies, caramels and salty snacks. For two decades, the eccentric and jovial Fuzziwig’s has expanded from one humble candy store in Colorado to a nationwide franchise spanning the coasts. And the store’s cornucopia of offerings is heightened by the bright and welcoming atmosphere, a combination of Willy Wonka and Disney, in the best ways possible. The selection is overwhelming to the middle-aged…One can only speculate about a child’s wide-eyed reaction. Responsibly-sourced cacao beans are handcrafted into artisanal perfections which embody the artistic approach to chocolate as a vessel. The truffles (any flavor) are divine, and they serve some delicious bittersweet sipping chocolate. A lovechild of Montana-based, French-trained pastry chefs, this renowned Bozeman chocolatier conjures some painting-worthy bites. The technique is apparent, as is the quality. Their reputation precedes them, even if not via features in Food & Wine and Alaskan Airlines magazines. Nearly 20 years young, this, yes, palace of sweets has a particular penchant for saltwater taffy and a kaleidoscope of fudges, all delightfully bittersweet, almost buttery. The Candy of the Month is a great way to try the seasonal specialty, so stop in and be a kid again.